Wort – How Much Dissolved Air Will It Typically Hold? I spent some of last week helping brewers troubleshoot issues with their wort aeration, so this seems like a good time to jot a few ideas about the limiting factors of dissolved gasses. Gasses dissolve into liquids based upon the ability of the liquid to hold a specific gas. For example, there are hydrocarbons that at room temperature can hold more than 200 mg/L of O2. Compare that to pure water, which holds only 45 mg/L of 100% oxygen gas. Air dissolved in wort will dissolve in about 1/5 the concentration of pure O2. Barometric pressure can also have an effect. Imagine you’re injecting air into wort and your brewery is in San Francisco at sea level: The air will hold about 16% more oxygen than if your brewery is on the Colorado Front Range at 5,300 feet, even though the relative percentage of oxygen compared to nitrogen is similar. Cold liquids have a greater ability to hold gas than warm liquids, so liquid temperature is another important factor in determining dO2 content. 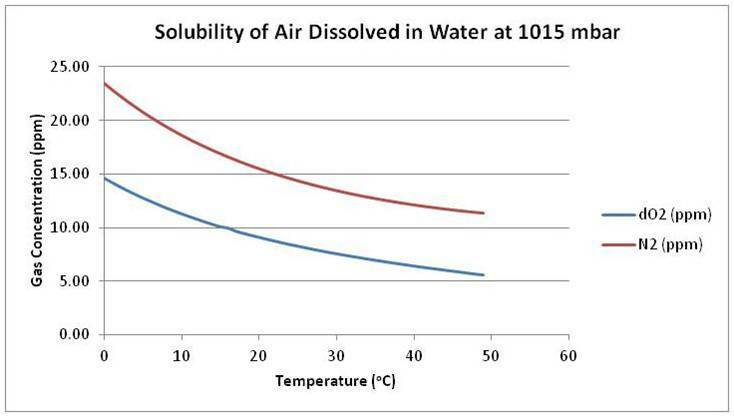 The graph below shows the relative concentration of air dissolved in water, based on temperature. The solubility of oxygen in wort is slightly less than water, but as far as I’m aware there is no published literature showing dO2 in wort according to temperature, so that’s why we’re using water as our example. My final thought comes back to the importance of controlling and closely monitoring those process parameters over which you have control. You may not be able to control barometric pressure, but you can be aware of it. And you do have control over temperature, so that’s another help toward meeting your goal of consistent dissolved gas levels. After I wrote last week about my recent experiences measuring dissolved oxygen in wort, I started thinking about how what ultimately matters is being able to replicate measurement parameters that tell you what you need to know, even if the numbers at certain points in the process don’t match what you are “supposed” to be achieving. Back in the late 1990s I had the opportunity to work with some excellent British brewers. When it came to their wort measurements, most of the dO2 readings from their inline instrumentation were significantly lower than expected compared to their fermentation vessel dO2. Yet they had still managed to determine their “ideal” inline process dO2 value. They did this by creating a five-way matrix based on liquid flow, gas injection volume, inline dO2 readings, tank dO2 readings, and the ultimate quality of the fermentation. They’d come up with those parameters because they didn’t always have a good place to put an inline process O2 probe. So they just put the probe in a convenient place and took the value – even though it was too low to be ideal by standard metrics — and then used what they knew, from experience, would give them the numbers they wanted to see in the fermentation vessel. For example, it was not unusual to see values of 5 to 7 ppm dO2 in their process pipe, but 9 to 12 ppb dO2 in the fermenter. That’s a huge difference, but given that not all of the gas had a chance to dissolve into the wort before reaching the O2 probe, it’s a completely probably reading. So let’s go back to the five metrics that I mentioned above. The liquid flow and the gas injection volume, or gas pressure, are the two factors over which you should have the most control. If the liquid flows at a specific rate and the gas is injected in a similar manner, the action should be completely repeatable. If you then measure the dO2 in the process pipe you should get a repeatable value if the first two factors are the same. If this can then be correlated to the dO2 in the fermentation vessel, you should be able to use the inline value to tell you when you have reached your target, even if the number seems improbably low. If factors like liquid flow and gas pressure are so easy to control and repeat, and if being sure of those values is such a link to your ultimate fermentation vessel dO2 goal, then why measure inline dO2 at all? I’d say we measure for the same reason we perform any quality parameter. If our overall goal is to maintain a consistent flavor profile, this is just one more way to insure that gas really is getting into the solution properly, and that the liquid flow is not out of whack. A system of reliable, repeatable monitoring will always be your best hedge against human error (hey, it happens!) and equipment failure. My final thought is that creating perfect fermentation is part art and part science. We use science to predict and check certain facts, but in the end the values we are “supposed” to be achieving may need the nuanced interpretation of the brewing artist. Last week I spent a couple of mornings measuring dissolved oxygen in wort at two different breweries. One was injecting oxygen and the other was injecting air. It was easy to get high dO2 concentrations injecting O2, but the air was another story – the O2 in the air simply didn’t want to fully saturate. Here’s a bit about the two setups. Each gas was injected into a process pipe where the brewery had the ability to control the volume of gas injected into the wort. In both cases the gas was injected at a similar distance from the measurement point. The two measurement points were off the process pipe through a sample valve and not in the fermentation vessel. The target gas concentration for the air injection was to achieve air saturation, which was about 9.5 ppm O2. The target for the oxygen injection was 15 to 17 ppm. The measured concentration of dO2 from the oxygen injection was as expected: between 15.0 to 17.5 ppm. But the dO2 with air was not the estimated 9.5 ppm, measuring instead around 7.5 ppm. Flow rates were similar, the distance to the measurement point was similar, the method of injection was similar, but not all of the oxygen in the air went into solution. Let’s explore a few different ideas as to why it’s more difficult to get saturation by injecting air. I think the main reason is that there’s just more total gas volume that needs to go into solution. To inject a given concentration of the O2 in air, you must inject four times more nitrogen than oxygen. Another other reason is that N2 isn’t as easy to dissolve into a liquid. If you dissolve air into water, about 40% of the gas that dissolves into solution will be O2, while 60% will be nitrogen. To get all of the gas into solution, the overall pressure in the process pipe needs to be high enough to dissolve not just the oxygen, but all the nitrogen. It’s not impossible to achieve, but it probably takes a little more time than if it is pure oxygen. Once you get the gas you want into solution, you still need to keep it from coming out of the wort in the fermentation vessel. If you’ve injected air, then it is important to keep some back pressure on the tank until the tank is filled and the liquid is quiescent. If you don’t maintain back pressure then the nitrogen can degas and potentially take some O2 with it. Even if you inject oxygen, it’s important to control the flow of wort into the fermentation vessel, keeping the fill as non-turbulent as possible so the O2 will stay in solution. My final thought is that there is a lot to keep track of, no matter which technique you use to oxygenate or aerate your wort. Be consistent, and make sure you understand your dissolved oxygen levels, so you’ll know if your yeast are getting enough to keep them happy.